IGT rarely fail to deliver when it comes to their dependable range of online slots and Garden Party is another example of how to design an entertaining and nice-looking slot. 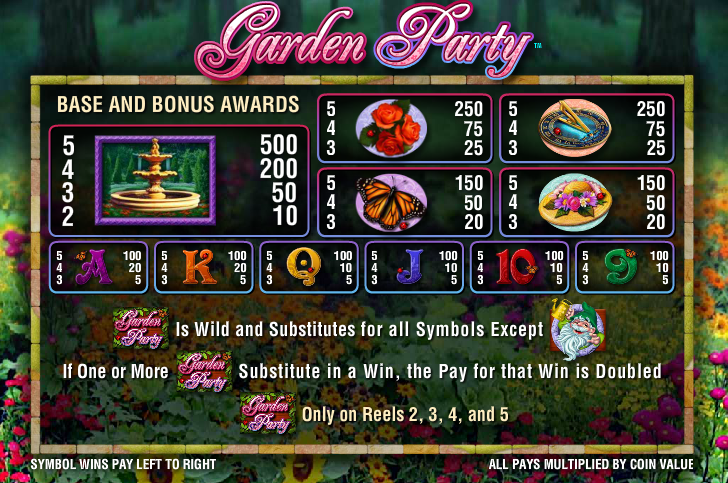 A garden party may not seem the most obvious theme around which to design a slot machine but if you play for a few minutes you’ll see things differently. There are five reels and 1024 ways to win. Legendary landscape gardener Capability Brown would have appreciated this game; the backdrop is a flowery scene with floating petals and pollen against which the reels are set. Basic symbols are represented by playing card symbols (adorned with ladybirds and butterflies) but the more valuable ones are all garden-related. We have a flowery hat, a sundial, a butterfly, a bunch of roses and an ornate fountain. There’s a Garden Party wild symbol and a scatter represented by a garden gnome. Multiway Xtra is IGT’s proprietary feature and essentially it means that with each spin there are 1024 ways to win. The way it works is that paylines are largely redundant and as long as matching symbols are on adjacent reels you’ll get a winning combo. As an extra feature, matching symbols on the same line will generate a multiplier for that win. 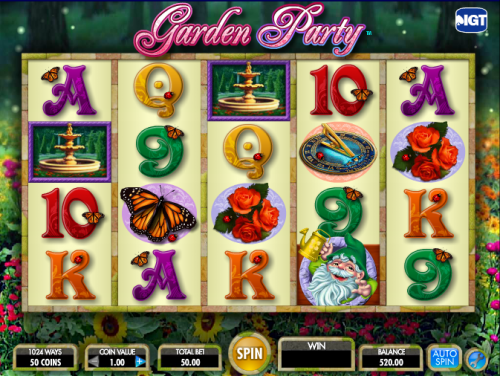 Garden Party is a really lovely-looking slot with some relaxing accompanying music and a lucrative bonus game. The Multiway Xtra feature adds plenty of winning opportunities so you won’t go too many spins without a win of some sort.